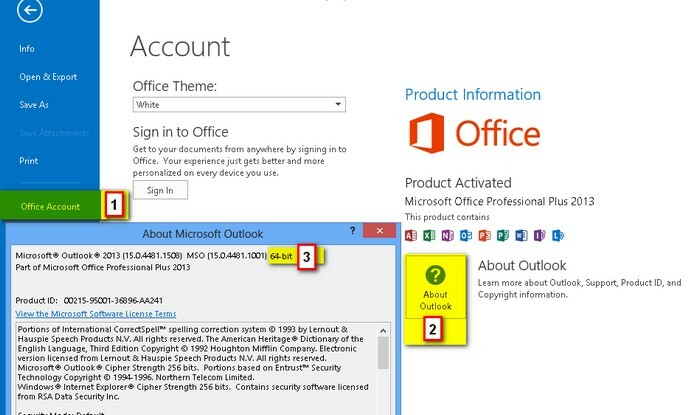 It may be important to determine which version of office you have installed for a number of reasons. Just because you have a Windows 64 bit operating System installed DOES NOT mean you have the 64 bit version of Office installed. The most common Office installation is 32bit. To determine which version you have installed, follow the numbers on your version of Outlook to determine if you have Outlook 32bit or Outlook 64 bit edition. 1. Start by going to the File menu near the top left of the screen.